"I’ve been using MyNewSkinUF7 MyNewSkin for about 18 months and am exceptionally happy with the results. I’ve tried a whole range of different skin products over the years and MyNewSkinUF7 is by far the most effective. The fact that it is 100% natural and has no nasty chemicals is even more reason to love it – as is the very affordable price! I now regularly receive compliments about the ‘healthy glow’ of my skin. This rarely happened before I started using MyNewSkinUF7. We have received hundreds of testimonials since launching in 2011, from people amazed at how their skin has improved and how healthy it now looks and feels. Only Nature provides the nutrients necessary to keep your face and body looking and feeling healthy, providing the nourishment to restore aged and damaged skin. In nature, the old is constantly being replaced with the new. With MyNewSkinUF7 we maximize this renewing principle by using a unique combination of our own hand-picked, fresh plant ingredients that are processed within minutes of being picked at our chemical-free fresh-herb ‘Farmacy’ in Queensland, Australia. Whatever nourishes the skin, restores the skin. It's just nature's way. Use MyNewSkinUF7 sparingly. A little goes a very long way. Our skin surface has a very fine lipid or fat membrane. One function of this membrane layer is to help prevent moisture loss. Overuse of soaps and detergents often strips away this lipid layer thus reducing the skin's ability to retain moisture. MyNewSkinUF7 helps to restore the skin's natural lipid membrane thus helping to retain moisture. Apply MyNewSkinUF7 twice daily. Our skin changes as we age. Fine lines, wrinkles, sagging, irregularity of skin pigmentation are some of the changes we notice. 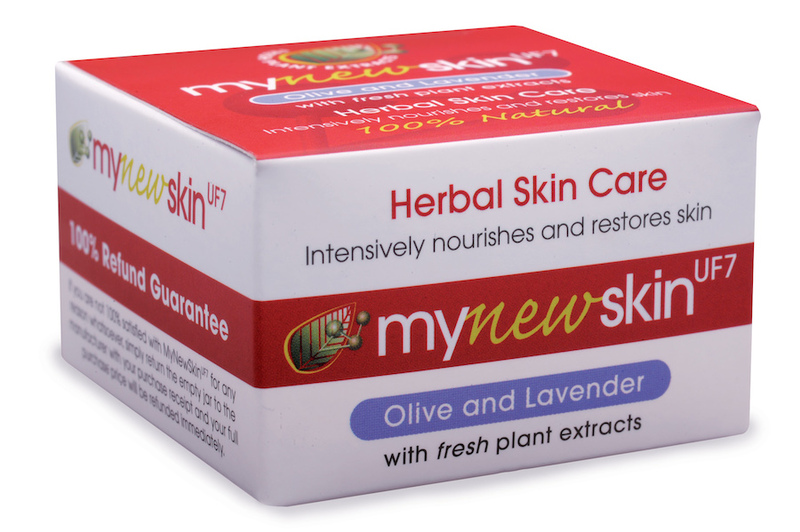 Each of the fresh plant extracts used in MyNewSkinUF7 are known for their skin health properties. Regular use of MyNewSkinUF7 will help to prevent and reduce the appearance of wrinkled, ageing skin. Apply twice daily. There are a number of possible causes of uneven skin tone including excessive sunlight exposure and hormonal fluctuations during pregnancy and menopause. MyNewSkinUF7 can help to improve the appearance of uneven skin tone. Apply MyNewSkinUF7 twice daily, for a minimum of 3 months. MyNewSkinUF7 does NOT contain: synthetic colours, fragrances, petro-chemicals and synthetic parabens. 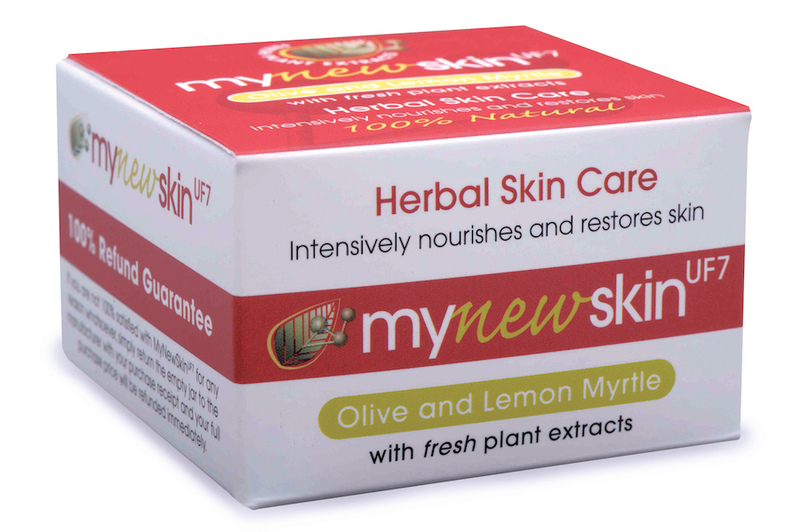 MyNewSkinUF7 does contain: Chemically free locally grown Australian olive oil (extra virgin, cold pressed), fresh-picked, skin-healthy extracts of: Burdock, Chickweed, Olive Leaf, Wild Oregano, Sheep Sorrel, Salad Burnett, Lantana, Ocean Salt, Bees Wax, Macadamia Wax, and Lavender or Lemon Myrtle Oil.